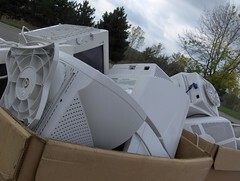 You can drop off your old electronics at our drop-off site on the first Saturday of each month. See below for our prices for materials. We can also provide you with a receipt with your tax-deductible donation. We take everything from TVs to computers to stereos. Basically, if it has a circuit board, we’ll recycle it. We team up with Valley City out of Grand Rapids to make sure the materials we collect aren’t shipped to a foreign country and burned. Remember: You can drop off e-waste at our Brown St. drop-off location on the first Saturday of every month!